“This is the kind of rhetoric we ask you to stand against today. 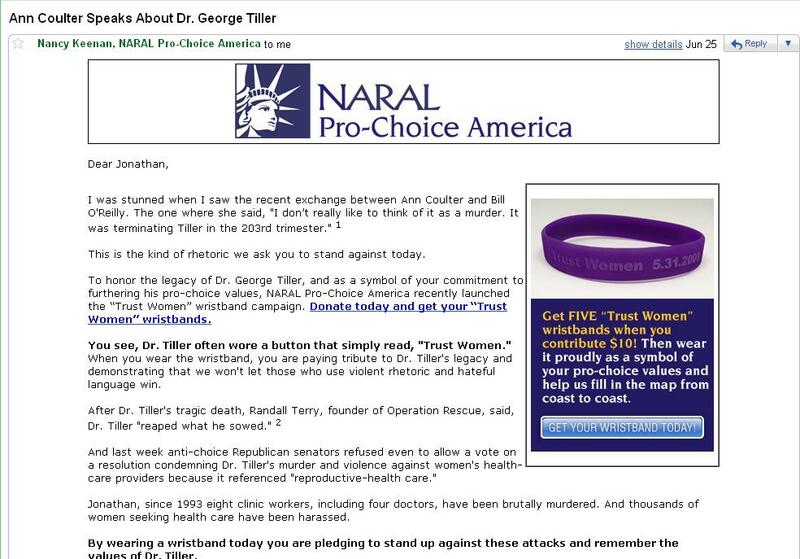 “To honor the legacy of Dr. George Tiller, and as a symbol of your commitment to furthering his pro-choice values, NARAL Pro-Choice America recently launched the ‘Trust Women’ wristband campaign. Donate today and get your ‘Trust Women’ wristbands. 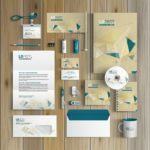 Since you’re reading this blog, this sort of missive likely is familiar: An advocacy group uses a current cause celebre to gin up donations. Such ad hoc initiatives tend to be especially effective (even if their ability to counteract the given evil is questionable). 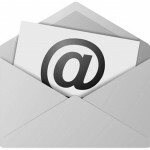 Accordingly, NARAL’s e-mail would have more been more powerful as an action alert. Instead of hitting people up for money in this still-dismal economy, the organization could have asked us to contact Fox News and/or our local affiliates, and demand that Coulter’s contract be cancelled or that O’Reilly issue a clarification. The resulting buzz might even have spurred some donations. A version of this blog post appeared on K Street Cafe on June 26, 2009.